Models 68L, 68LS, D88L, D88LS (loop fastening) and 68C, 68CS (clip fastening) are Inside-Waistband or IWB magazine carriers. 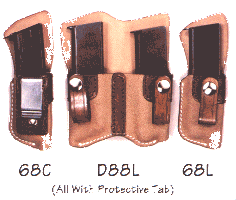 They are eminently suitable for use with the 62 series of IWB holsters, or with any other holster or holsters in the Horseshoe range. Twin carriers D88L and D88LS are available for large frame auto single-stack magazines only. The others are available for all magazines, both single and double stack. The rear protective tab option is available (S in model designation denotes no protective tab). 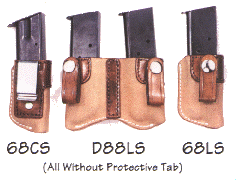 Check the Holster Selector Chart for availability.